Learners successfully completing PAT training in Glasgow are awarded a Certificate of Competence. The training, which offers practical experience as well as theoretical learning, gives course participants an important advantage when applying for jobs. It is suitable for newcomers looking to start a new career, as well as those who wish to carry out their own PAT testing in the workplace. The fact that an individual has attended PAT training and has a certificate of competence will also enhance their CV and future career prospects. Course participants receive instruction from skilled and experienced trainers on a wide range of elements, both theoretical and practical, in order to ensure they become competent PAT testers. Learners are taught the principles of electricity and as health and safety is always an important issue in the working environment, the dangers of working with electricity are also covered. Participants learn the about the classification of appliances, as well as the legal requirements when carrying out PAT testing. The IEE Code of Practice is covered, along with the accurate recording of results following PAT testing. 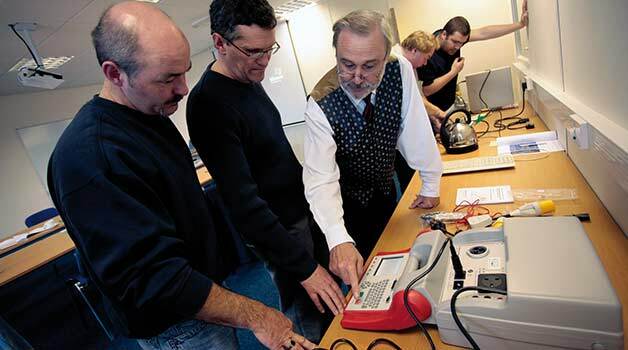 Course attendees also learn how to use a PAT tester. A 20 question written examination demonstrating your knowledge in the subject will be taken. Having successfully completed the course and an exam, candidates receive certificates indicating their competence. Tutors monitor the attendees throughout the course of the day in order to ensure they have a thorough understanding of the subject. This is a one-day course, running from 9 am to 4 pm. Morning tea or coffee and a buffet lunch are provided for all participants. The course is held in the Premier Inn in Motherwell. The postcode is ML1 5SY. This course is suitable for anyone interested in testing appliances for electrical safety, regardless of background. Attendees are asked to bring a copy of the IEE Code of Practice with them, but this is not a requirement. Those attending the PAT course have access to the PAT testing handbook, which is provided free as part of the course. The course notes made available are very comprehensive and participants receive a PAT reference card. Glasgow PAT training takes the form of a comprehensive course, which concentrates not only on theory, but also offers important practical, hands on, experience.